On Thursday, January 8, at Nørrebro we'll be releasing an early tasting (3 months) of the Russian Imperial Stout project. Just a few days before I departed for a two week holiday in Vermont, Murphy, Mikkel, Jens Ungstrup, and myself sat down for beers at Ølbaren and, unintentionally, began brainstorming names. Eventually I threw out the name "Seven Sins" and Jens countered with simplicity: Seven. The name stuck. For obvious reasons - seven brewers, seven recipes... and all seven of these project participants are expected to attend on Thursday. This current release is of the stainless steel version (my personal favorite). The picture shown here is me topping off the Bordeaux barrel. The oak aged version(s) will either be blended or released individually - hand bottled, bottle conditioned, with some limited draft (most likely at the debut at the brewpub). In other news, the 2008 brewing of the Stevns CCC (originally a guest brew with Will Meyers of Cambridge Brewing Company, modeled after his Cerise Cassee) was nearly successful... A five hour sparge and less than expected yield and gravity. My first 48 hour sour mash. 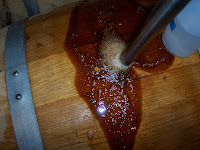 It will be introduced to Pinot Noir and Merlot barrels in the next two weeks - where it will be blended, in each barrel, with the 2007 version and introduced, again, to Lactic bacteria and several strains of Brettanomyces.